Using data from the LAMP instrument aboard NASA’s Lunar Reconnaissance Orbiter, scientists have discovered two geologically young craters in the darkest regions of the Moon’s south pole. One lies within Slater Crater, named for the late Dr. David C. Slater, a former SwRI space scientist who designed and built the LAMP instrument. Albedo map credit: NASA GSFC/SwRI; Topographic map credit: NASA GSFC/ASU Jmoon. A Southwest Research Institute-led team of scientists discovered two geologically young craters — one 16 million, the other between 75 and 420 million, years old — in the Moon’s darkest regions. Key to this discovery was the SwRI-developed Lyman-Alpha Mapping Project (LAMP) instrument aboard NASA’s Lunar Reconnaissance Orbiter (LRO). LAMP uses the far-ultraviolet Lyman-alpha band skyglow and light from ultraviolet-bright stars LAMP to “see” in the dark and image the permanently shaded regions of the Moon. 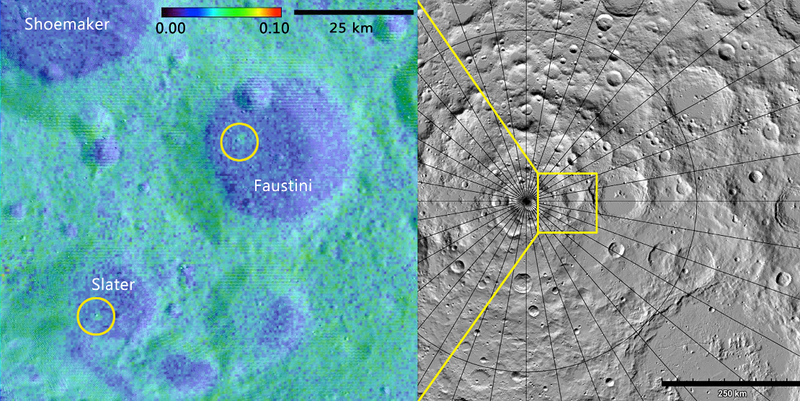 Using LAMP and LRO’s Mini-RF radar data, the team mapped the floors of very large, deep craters near the lunar south pole. These deep craters are difficult to study because sunlight never illuminates them directly. Tiny differences in reflectivity, or albedo, measured by LAMP allowed scientists to discover these two craters and estimate their ages. Collisions in space have played an important role in the formation of the solar system, including the formation of the Moon. Impact craters tell the history of collisions between objects in the solar system. Because the Moon has been peppered with impacts, its surface serves as a record of its past. Determining when collisions occurred helps scientists map the motion of objects in the solar system throughout its history. Craters that are young on geological timescales (millions of years) also provide information on the frequency of collisions. When a small object collides with a larger object, such as the Moon, the impact creates a crater on the larger body. Craters can be a few feet in diameter or several miles wide. During the impact, the material ejected forms a blanket of material surrounding the crater. The ejecta blankets of “fresh,” relatively young craters have rough surfaces of rubble and a sprinkling of condensed, bright dust. Over millions of years, these features undergo weathering and become covered with layers of fluffy, dark dust. Scientists determined that the areas around the two craters were brighter and rougher than the surrounding landscape. The team estimated the age of one crater at about 16 million years. The other crater’s rough extended ejecta blanket had faded, showing that this crater must be at least 75 million years old. But time would have completely covered the ejecta blanket in fluffy dust within 420 million years, providing an upper limit on its age. Other images, produced using laser altimetry and sunlight scattered off crater walls, provided details about topography, surface features, and material properties. 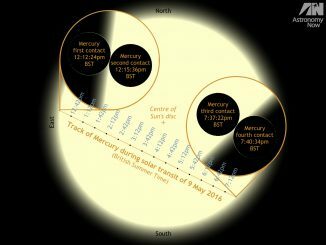 On Monday, 9 May just after midday BST, suitably equipped observers in the British Isles can witness the start of a 7½-hour spectacle that hasn’t been seen for almost a decade — the silhouette of innermost planet Mercury crossing the face of the Sun. Here’s our online guide to observing this fascinating and comparatively rare event in complete safety. 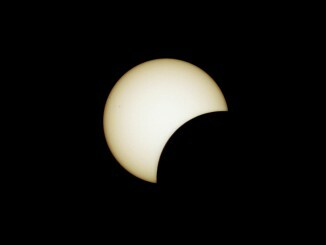 A partial eclipse of the Sun is set to wow North Americans this afternoon (23 October) as the Moon’s silhouette will be seen to cover as much as 50 percent of the Sun from the USA, and up to 80 percent of the Sun in northern Canada. In the small hours of Friday, 16 October, innermost planet Mercury reaches its greatest westerly elongation from the Sun. 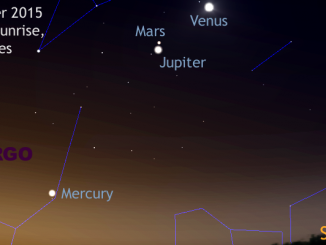 For those of you in the UK with a flat, unobscured eastern horizon and willing to get up an hour before sunrise, the next few days provide your best opportunity to see Mercury from the Northern Hemisphere during 2015.